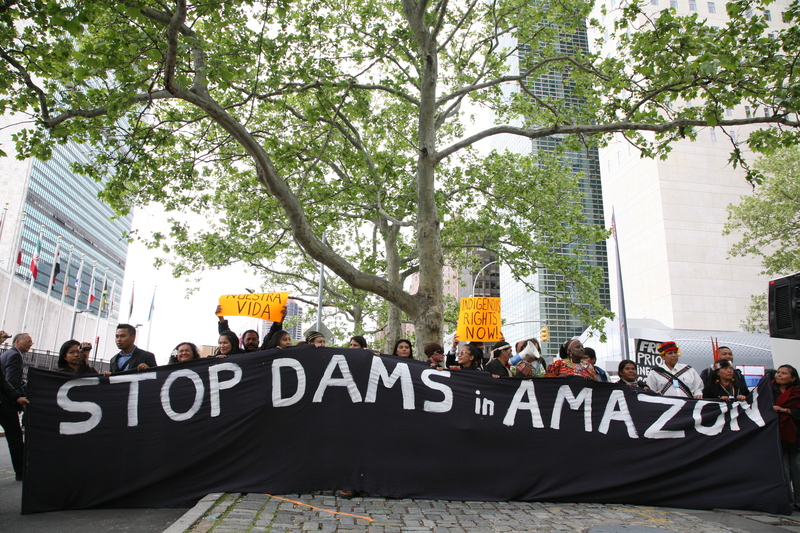 UNITED NATIONS, New York City – A side event at the United Nations Permanent Forum on Indigenous Issues turned into confrontation on Wednesday as a panel discussing the effects of hydroelectric dams on indigenous populations was met with terse responses from the governments of Brazil and Peru. The heated exchanges took place shortly before a planned protest march from the UN to the Brazilian Mission, where actress Sigourney Weaver lent her celebrity power to efforts by indigenous groups to stop Brazil’s Belo Monte dam. The side event panel, led by Tom Goldtooth, Executive Director of the Indigenous Environmental Network, presented evidence of dam-induced destruction of ecosystems and indigenous populations around the globe. Routinely touted as “clean energy” by pro-hydroelectric interests, Goldtooth explained that dams wash out fragile river ecosystems and displace surrounding communities, heavily impacting lifeways and livelihoods. One of the areas discussed in detail was the Xingu River region of Brazil, where local indigenous people are fighting the proposed Belo Monte dam. If built, this hydro-electric project will be the third-largest in the world, behind the Three Gorges Dam in China and the Itaipu Dam, Brazil-Paraguay. 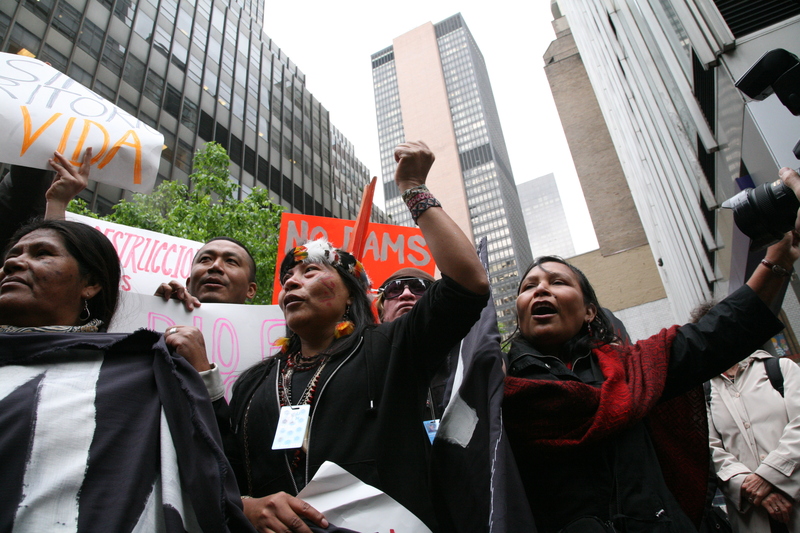 First proposed in 1990, Belo Monte has been fraught with controversy and protest. On April 20, the Brazilian government moved the project significantly forward, awarding the building rights to Norte Energia, a consortium of nine companies led by Chesf, a subsidiary of Electrobras, Latin America’s largest power utility company. Immediately following the UN panel presentation, the Minister of the Brazilian Mission to the United Nations, Maria Teresa Mesquita Pessoa, responded by saying the information given was “two years old” and did not “accurately reflect the consultations” that had taken place with local indigenous people. Speaking in clear English, Pessoa resolutely defended the merits of the Belo Monte dam project. A representative of the Peruvian Mission to the United Nations requested to speak next, and defended his country’s position on hydro-electricity projects as well. IEN’s Tom Goldtooth later noted that it was unusual for governments to officially respond in such a manner during side events at the Forum. 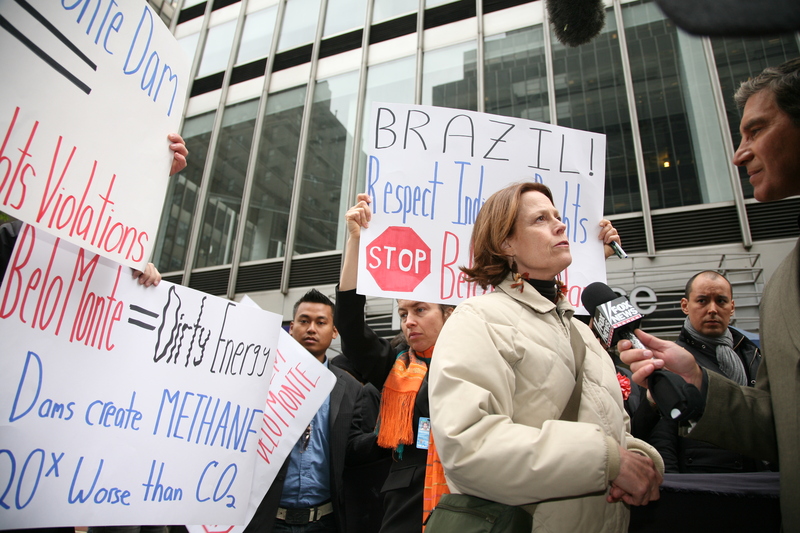 Actress Sigourney Weaver, most recently known for playing botanist Dr. Grace Augustine in the movie Avatar, joined the protest at the Brazilian Mission. Post-Avatar, Weaver has traveled with Director James Cameron to the Xingu region of Brazil, and has met with local tribes and government officials in an effort to support the indigenous people of the region and stop the Belo Monte Dam. When asked how she felt this related to the experience of being from the United States, Weaver said, “It breaks my heart to see Brazil have the opportunity to do things differently and not take advantage of it. What I felt listening to the tribal leaders (in Brazil) is that we have not listened to our tribal leaders here in the U.S. and it has caused such a rift…Brazil has the opportunity to learn from mistakes that other countries have made and support the ancient way of life of the indigenous people.” Unfortunately in America, we know what happens when people aren’t heard and aren’t included. You can’t go back, you can’t undo the damage done to the original homelands and the original way of life. Indian Education began early in the history of the United States. As a concept, the efforts to educate were rooted in the attempts to move the Indian from a foreign adversary to a participant in the building of a new nation. As a reality, Indian education by the federal government necessarily had to be an assimilating force, as the Western way of life was so completely foreign to all tribes living in what is now America. Existing cultures were sacrificed in the name of nation building and peace-making. Education was a bargaining point in many treaties signed by the federal government, and thus the value of education was recognized and understood. The role and quality of that education, however, was always shaped by the current relationship of the United States government to tribes, and the shifting philosophies of the role of the federal government in relationship to Indian people. The beginnings of a formalized method of “Indian Education,” with any identifiable consistency, took place during early Westward expansion in the nineteenth century. These earliest efforts were carried out by Christian missionaries with the inferred consent of the federal government. Both Catholic and Protestant churches were represented, and which group gained entry into a particular Indian territory was largely guided by which European nation had made first contact and established relationships within that tribe, establishing trade and learning the customs and language. The English brought Protestantism with them, the French and Spanish, Catholicism. There are very rich and detailed first–hand accounts of missionaries working to create Indian schools in the territories, and while their intent was to offer some semblance of Western education, primary motivation was clearly to “save souls” and bring the “wild and heathen” natives to salvation. A great push was made to raise the funds necessary to support these efforts, and it became an ongoing “good work” of parishioners in Europe and established American cities to tithe funds for the salvation and education of Indian children. The first dramatic shift in the federal government’s laissez-faire approach to educating Indians was brought about by Army Captain Richard H. Pratt, who founded the Carlisle Indian School at an abandoned military post in Pennsylvania on November 1, 1878. His model for training prisoner–students became the basis for the Off-Reservation Indian boarding school. Famous for the phrase, “Kill the Indian and save the man,” Pratt intended to prove that Indians could be taught Western European ways and therefore be made into citizens rather than die at the noose or the firing squad. In a closely watched “experiment,” he employed military tactics of discipline, isolation and repetition to “re-educate” Indians. His work was considered to be a success, and Pratt’s methods became the early model for Indian boarding schools nationwide. Pratt was a veteran of the Indian Wars, and therefore had extensive exposure to Indian people, mostly as prisoners. In 1875, Pratt was in charge of 72 Apache prisoners at Ft. Marion near St. Augustine, Florida, and he made a concerted effort to teach these men how to “elevate” themselves by learning the white European way of life. When the prisoners were released, in 1878, Pratt was successful in convincing 22 of them to continue their education. Records indicate that several of them went to The Hampton Institute, a school for freed slaves in Virginia. With this “success” in hand, Pratt was allowed to resign his Army commission and continue to develop his ideas on Indian education, which were considered liberal at the time. 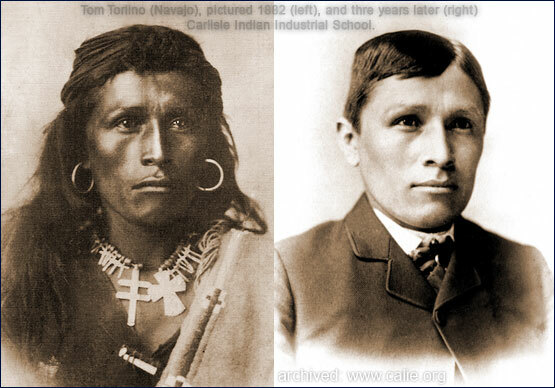 He advocated this re-conditioning policy to the US Secretary of War, who then allowed him to establish the Carlisle Industrial Training School, the first co-educational, multi-tribal Indian boarding school. The General Allotment Act of 1887, commonly known as the Dawes Act, incorporated the Carlisle model into government policy. By 1902 there were twenty-five federally funded non-reservation boarding schools in fifteen states and territories modeled after the Carlisle’s military methods. Total enrollment was over 6,000 students. Attendance at boarding schools was mandatory in some areas, and children as young as age three were taken from families and placed in boarding facilities for education and assimilation into mainstream Euro-American society. While Pratt had good intentions of saving Indians from slaughter by creating a reform system, what ensued during the Boarding School Era was a painful tug-of-war between Indian people and the federal government. Sacrificing family and cultural ties for assimilation and education was coldly dealt out as a means to provide long-term survival for native people. However, for those families whose children were forcibly removed, it seemed an unreasonable sacrifice. For many of the children who attended the boarding schools – which were developed under a policy founded in military conditions for adult prisoners – the reality of the transition from home to school was especially cruel. These boarding school children went from the warmth of family life and familiar culture and language to the sterile and disciplined environment of a militarized boarding school, where they were expected to learn a new language, adopt a new way of life, and leave behind all traces of their familiar culture. In order to make the new training “stick,” many children were not allowed to see their families for years at a time, and when they did return home, were unable to fit back into life as they once knew it, sometimes loosing their language and therefore their ability to communicate with their own families. A systematic suppression of American Indian culture occurred during this era, which included the banning of American Indian spiritual practices and the speaking of native language, all of which held severe punitive repercussions. Reed introduced the concept of training Indian youth to be agricultural workers, and included a focus on the cultural arts for the first time in the Rules of Indian Education. Her primary concern was economic self-sufficiency, and she saw the benefit of commodifying the native traditional cultural arts such as basket making. The unintended benefit, however, was a preservation of some traditional art forms, the evidence of which is prized by collectors and held in museums today. Reed held her position until 1910, and her legacy of emphasizing vocational training lasted long past her tenure as director of Indian Education. In 1915, the book of Rules once again limited academics, favoring handiwork skills over even the basic instruction of the English language and reading. During the economic boom time of the 1920’s, public interest in the life of Native people rose dramatically. The Santa Fe Railroad had effectively invented tourism to the American West, and travel posters beckoned the traveler to explore previously unseen Native lands. This public interest, driven by tourism marketing and the railroad industry, led to increased coverage of Indian life in newspapers and magazines. When the public became aware of the state of native youth and Indian Education, pressure was laid on the federal government to improve conditions. Intense public criticism led the current Secretary of the Interior, Hubert Work, to commission a report by the Brookings Institute to investigate Indian education. The resulting document, published in 1928, came to be known as the Meriam Report, after principle author Lewis Miriam. The Meriam Report called for a complete revision in federal Indian Education policy, including an overhaul of the very nature of education in Indian schools. It reported on the apparent failure of vocational training, and recommended that the government arrest the work to assimilate the Indian child, replacing it with a child-centered approach that would be attentive to the needs of each individual student. The report challenged the department of Indian Education to employ vocational, academic, and cultural studies to the full benefit of the Indian student. In a bold move that reflected the general public’s interest in Native America, the Report suggested that Indian schools incorporate “key elements of Indian life and culture” into the curriculum. Meriam marked a significant turning point in Indian education. Not only for it’s findings, but also for it’s role in displaying the power of public opinion and “modern” media in the forming of federal Indian policies. Good Housekeeping Magazine, which was very popular and well–read across America during this time, ran a series of articles about Indian education based upon the Meriam Report. The resulting public outcry led to the Hoover administration’s almost doubling of federal appropriations to Indian schools between 1928 and 1933. These collective developments were referred to as the Indian New Deal, and were considered part of the social reform movement that swept through the United States in the aftermath of the Great Depression. For the next generations of Indian school children, life was a little easier at the off-reservation boarding schools. While conditions and educational standards were not on par with mainstream public schools, children were no longer subjected to the earlier militaristic assimilation policies, and were often allowed to return home during the Summer months. While these are small concessions for native youth who were separated from family, environment and culture, they were vast improvements from previous Indian Education policy. The Meriam Report stated, “The Indian family and social structure must be strengthened, not destroyed…” and while efforts were made to change policy, the reality of application did not always measure up. In hindsight, it is clear that while the overt intention shifted away from “kill the Indian to save the man,” the boarding school experience continued to irrevocably change the realities of Indian life with each passing generation, adding to the cumulative loss of culture, language, and the unique experience of being Indian and part of the extended network of tribal family. The increased federal funding during the New Deal period went to “local districts, reservation day schools, and public schools which had been established on Indian trust lands.” These additional federal funds allowed for Indian children to get an education while staying closer to home. This period of Indian education lasted about twenty years, until the federal termination policies took hold during the 1950’s. During this time, federal Indian policy literally terminated the recognition of some Indian tribes, with the eventual goal of again assimilating native people into the mainstream society. With the era of tribal termination came extreme budget cuts, reversing much of the progress for Indian education that had been in place since the New Deal. Many of the local tribal day schools were closed due to lack of federal funding. The educational life of thousands of Indian children, over many decades, has been at the mercy of the fluctuations in federal policy, and the expansion and contraction of Congressional appropriations. As children’s lives are so shaped by the time spent in school, these shifts in policy and their practical application have had direct influence on generations of Indian children and their families. The next phase in Indian Education policies coincided with the Civil Rights Movement of the 1960’s. Historically, a resurgence of focus on social services across the board tends to include renewed energy and funding for Indian programs, including education. In 1966, the Presidential Task Force on Indian Affairs outlined new emphasis on Indian Education, placing responsibility for improving life for native people on the improvement of the educational system, strongly endorsing Indian control of the school systems and the need for quality education. In 1968, a Special Senate Subcommittee on Indian Education, under the Senate Committee on Labor and Public Welfare, conducted an extensive hearing on Indian education. The resulting report, “Indian Education: A National Tragedy – A National Challenge” was published in 1969. This comprehensive document, commonly known as The Kennedy Report, focused national attention on the state of education for American Indian and Alaska Native students. The 60-point report recommended increased tribal control in education policies and across-the-board improvements in indian education, including the creation of a National Indian board of education, which spurred the creation of the National Indian Education Association (NIEA). It also called for the creation of an exemplary federal school system for Indian students. The report included historical analysis, and stated that “the coercive assimilation policy has had disastrous effects on the education of Indian children…” It pointed to the results of generations of assimilation policies, including scathing criticism of a failed government responsibility to educate Indian children and be respectful of cultural differences. The next major milestone for tribes and Indian education policy came on July 8, 1970, when President Nixon delivered a message to Congress ordering a new approach on Indian policy, condemning forced termination and specifying recommendations for Indian self-determination. A direct result of Nixon’s declaration was the Indian Education Act of 1972, which established the Office of Indian Education and the National Advisory Council on Indian Education. The Act primarily sought to uplift the academic performance of Indian and Alaska Native students while honoring unique tribal identity and maintaining cultural traditions, thereby giving them the tools to succeed in modern society without the intent of assimilation into mainstream Euro-American culture. Subsequent legislation has built upon the Indian Education Act of 1972, and has included the following revisions and reauthorizations: In 1974, PL 93-380 amends the Act to add a teacher training program and a fellowship program; The 1975 Congress passed the Indian Self-Determination and Education Assistance Act; 1988: PL 100-297 makes BIA funded schools eligible to apply for formula grants. Also creates an authorization for Gifted and Talented education; 1994: PL 103-382 reauthorizes Indian Education as Title IX Part A of ESEA. The formula grants reauthorization is amended to require a comprehensive plan to meet the academic and culturally related academic needs of American Indian and Alaska Native students; 2001: PL 107-110 Indian Education is reauthorized as Title VII Part A of the No Child Left Behind Act. The formula grants are to be based on challenging State academic content and student academic achievement standards that are used for all students and designed to assist Indian students in meeting those standards. 4. It provides services to American Indians and Alaska Natives that are not provided by the Bureau of Indian Affairs. Today, 56 community-controlled schools operate under contract from the BIA (OIEP schools). In addition, 20 tribally-controlled community colleges have been started. The 103 elementary and secondary schools still operated directly by the BIA now have local Indian school boards with a voice in the operation of the school, including the selection of staff. While not as prevalent, the American Indian boarding school still exists, although attendance is voluntary. Most schools now work closely with surrounding American Indian tribes, employing tribal members as staff and reflecting the culture of American Indian students as part of its educational programming. Locally controlled, BIA-operated, and public schools have all sought to hire more Indian teachers and administrators and to engage in local curriculum development. A few schools now provide initial reading instruction in tribal languages, and most schools that serve Indian children teach some tribal history and culture. In most recent years, tribal councils implementing self-determination policies have been expanding their influence and decision–making power into the education system. Tribal education policies are created to express a strong commitment to educational excellence as well as tribal languages and cultures. For example, the Navajo tribal educational policies of 1985 declared that the Navajo language was an essential element of the life, culture, and identity of the tribe and mandated school instruction in both Navajo and English. On November 6, 2000, President Bill Clinton issued and signed Executive Order 13175, mandating Consultation and Coordination with Indian Tribal Governments in the formation of federal Indian policy. 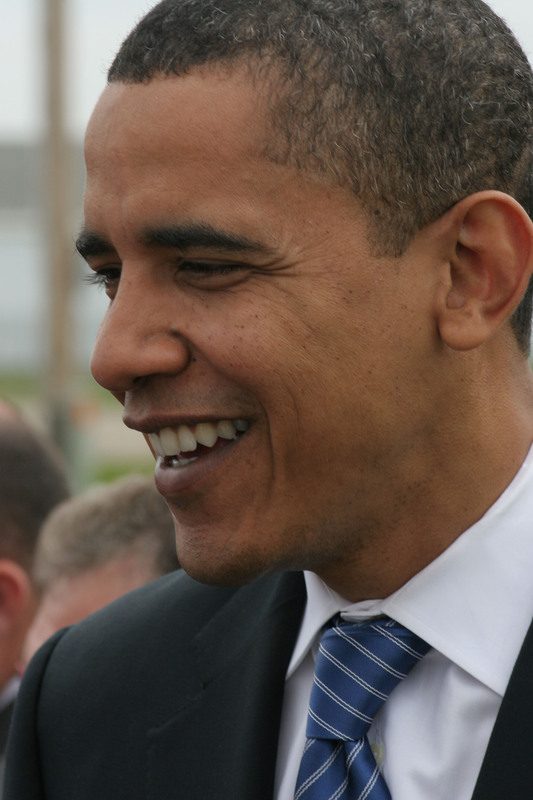 In a significant step toward the next phase of development in Federal Indian Policy, President Barack Obama signed an Executive Memorandum on November 5, 2009, during the White House Tribal Nations Conference held at the Interior Department’s headquarters in D.C, that directs all Federal departments and agencies to develop a “plan of actions” to implement the policies and directives of Executive Order 13175. While much progress has been made in Indian education since the Kennedy Report and Nixon’s era of Tribal Self-determination, Indian and Alaska Native students are still struggling with achievement levels far below the national average. In addition, the full effect of psycho-social ills seen in poverty–stricken communities is widely evident. These effects include widespread drug and alcohol use, endemic problems with gang activities, truancy, anecdotal violence within the school population, the nation’s highest rates of teenage suicides, and other forms of anti-social, addictive, self-medicating and self-destructive behaviors. There have been many attempts to analyze and address the problems endemic in Native youth, both within the schools systems and in the tribal communities. It is clear that the problems facing Indian and Alaska Native students are monumental, and the contributing factors of historical maltreatment of Indian people cannot be underestimated. The renovation of tribal communities and the family structures is an on-going process. However, the key to addressing current needs of Indian and Alaska Native students is to deal with the immediate high risks to the health and safety of those 44,000 children being served by the Department of Indian Education. There is an opportunity to create a significant change, expeditiously, for those students being served by the education system, by providing access to education, support services, and tools related to those threats to personal health and safety that have invaded schools nationwide. Students can only thrive when they are in a safe and nurturing environment. It is through the continued development of the optimal learning environment that Indian children will recognize their true potential and have the opportunity to excel. Ward Churchill, agree with him or not, has become an internationally-known symbol of Native American protest against the United States goverament, the “establishment ” and against anyone who would challenge his right to speak freely. Churchill’s controversial writings and speeches, and subsequent termination from his tenured position as an Ethnic Studies Professor at the University of Colorado, Boulder, have gotten unprecedented media coverage world-wide. His very status as American Indian has been challenged, by Native and non-Native alike, yet he persists in current affairs as the number-one most recognized Native American voice in the mainstream media. Churchill is representing Native America, in some respects, to the greater public and the world, with media coverage literally circling the globe. A quick Google search turns up stories from every major news agency in America, plus coverage on Al-Jazeera, the Chinese newswire, and news programs in New Zealand and India, to name only a few. He is the center of a firestorm of controversy, and many Native people have become frustrated by the attention he has garnered in the name of Indian people. He has certainly been accused of making things harder for Native people in the Rocky Mountain region, as AIM support has given the impression to some that he does stand for Indian people at large. Ward Churchill’s supporters, including Russell Means and the Denver Chapter of AIM, are fiercely loyal. They stand behind Churchill to support not only the man, but also his messages. The day after Ward Churchill was fired by the Colorado University Board of Regents, he invited us to come out to his home in Boulder to interview him and talk about the issues. Russell Means was there, and became part of our conversation, which went long into the afternoon and covered some unexpected ground. The Native Voice: A lot of people know of you from the headlines, but they don’t know you as a person, per se. You’ve become more of a symbol. TNV: Your work at the University of Colorado in Boulder has been presented as radical. When you first started working as a professor, as a teacher, were your goals different then, from what they became in recent years, what we see today? Churchill: No It’s kind of like this interview. It may have been different in a sense that I may have had different points of focus because, if you work enough at a base to try to rectify the Indian-White relations, or how ever you want to frame that, there are almost an infinite number of points of focus that you have to select from, so you can move from one to another to another and basically you’re doing the same thing. It’s just that your framing is going to be different. The truth of the matter is, I’ve been standing on the same bedrock, the same foundation all my adult life. Whether in the formal academic sense or an activist sense or a combination of the two, which has usually been the case. TNV: Can you explain where that foundation comes from? Churchill: In a way, it’s a paraphrase: In ’74 when they convened the International Treaty Council – the meeting, not the organization – what came of that was they gave the pipe to Russ (Russell Means) and he accepted it with a responsibility to take the 1868 Treaty in front of the community of nations to get involved in that particular discourse and to be considered in that way. From the 1868 Treaty, then, by extension, you’ve got all these other sets of treaty relations between the Feds and indigenous peoples. In the end that translates to global treaty study that was undertaken by Alphonso Martinez during the later part of the 1980’s. That’s how these things hook up, but it was to take what was known to people in a particular context and put it where it belongs, which is in the international discourse because it is an international relations issue. My thing has always to been take “Indian affairs,” as that term is applied by a federal government, the sets of relations that are involved there and the history of that, and put it into the discourse of the consequence of people. More broadly, it is that consideration of indigenous people – their relations, their rights, and so forth – as not some esoteric side line field, but as part of the old world flow of the whole. That doesn’t land in a standard university Indian Studies position where Indians are developing knowledge and putting it in these Western forms for their own purposes, for internal education (that’s valid for as far is it goes, and I actually participated in it, but its not my focus). It’s also not to try to make Indians a part of the greater whole in the sense of being minorities. Indians speak from their own position with the same integrity and right to be heard and considered in connection and comparison with other minority groups as anybody else. TNV: So, who is your audience? Indians? Non-Indians? Churchill: I’m always talking to Indians, to White folks, and Africans, Puerto Ricans and everybody else. We’ve got points in common. For one, we’ve got a common oppressor. Churchill: A lot of these groups even including some of the White groups, have our different histories. We understand our differences and our commonalities clearly among ourselves. We have a basis for interacting and respect in the real world. How do you get to that understanding? Well, you don’t do anything without consciousness, okay? Because consciousness is not insular, nor is it homogenous, like stirring cream into coffee. TNV: So what was the basis of the problem at CU? Why do you think, ultimately, that they built a case against you to fire you? Churchill: I don’t strive for either of these poles, so there is this tension at CU. But that’s where Indian studies was supposed to fit in the first place. Most people have forgotten this. We’ve got so many damn people trying to be professional according to quote-un quote standards that we were supposed to transcend! Our purpose was to transcend our understanding of Indian studies, to change them, to make them other than what they were through standard education. TNV: When I was in college taking Native American studies, the first thing the professor said on the first day of class was that “Anything you ever learned in any classroom about Native America was all wrong. For you to be successful in this class past this day with me you have to be able to forget it” and start over to build your knowledge and understanding. I thought it was brilliant. Churchill: (continuing )…well truth of the matter is they can’t. That’s what’s scary, its not like you give em a pill. But in variable degrees of openness they can unpack a lot of this stuff and they can do it in a hurry if you approach them right. And maybe that’s what the Creator gave me was an ability to straddle those two things because I can talk to Indian students and other people. I’m consistent with Indian peoples’ understanding, but I can nail these little White buggers right there in their seat and you can almost watch them undergo transformation. It’s like the cartoon of the lightbulb going on its like, “Oh sh*t.” You know, walk em into it. Let them walk themselves into a box of an argument. And they realize they are in a box and they have to think their way out and it scares them to death because the final product of any course that I ever teach is that you gotta sit down and tell me what was important in the subject matter, and why you thought it was important. Pick anything you want from the whole subject matter. One little point in it or something you connected to from your own experience to the subject matter. But, you gotta explain why that is and then you’re gonna tell me what you’re gonna do with that outside the goddamn classroom in the real world. TNV: Do you think that the part of that experience that you have with the students has been the context of the a big, public, state university system that you’re teaching in? For example, different schools have different expectations for their students, how they want them to learn, what they expect them to do with the information, etc. Meaning, a large university system undergraduate college versus a private liberal arts institution? Churchill: Yeah, and you can still do it in a big school context. But where this does start to break down is with the number of students in the classroom. I’ve taught sections of 200 students, and you can’t really do what I’m talking about with that many students. That starts to debilitate towards these idiotic instruments where you’re assigning arbitrary scores and you end up with people who are really able to do something with the information, they’ve got a handle on the subject matter, and they get a C because they’re not good at taking tests. And you got people who are total ciphers in terms of moral implications or the ethical implications or so on but they know how to do well taking tests and they are getting A’s. I taught 100-student blocks and I could get closer to what I’m talking about. TNV: One of the things the media has focused on is how much money you make and how much you have cost CU. It has been reported that you will be paid $96,000 in severance for this upcoming year, and that the court case cost CU $352,000. Churchill: It takes roughly 25 students at the University of Colorado to pay for a course. Anything beyond that is excess, is profit. So, if I’m teaching a 200 student block then I’m generating three dollars in profit in the institution for every dollar I’m using to deliver the course. One line on that is the quote that tax payers of the state of Colorado, who anti-up six cents on each dollar of the operating budget for the institution, are paying for me. In fact, they have never paid me a dime, ever. I’ve been at CU since 1978 in different capacities. In fact, if we were to settle accounts, they could send me a few million dollars that I’ve generated in income for them. TNV: What about the point that there are two sides to every story, or at least two perspectives. Churchill: Yeah, that’s what the Nazis said about the Holocaust. TNV: Well, that’s a whole other discussion. Churchill: No, it’s not. You said “every story.” That is a story (the Holocaust). No one expects that there will be another side to that story. Churchill: …That’s just another story. There’s not necessarily another side. That’s what I’m trying to tell you. The other side could be absolutely fraudulent. There is no other side. Churchill: …I’m not accepting that there’s two sides to every story. I’m saying that there can be the truth and there can be bulls*** and that’s the two sides. TNV: I don’t know how to answer that question. Churchill: Nobody does, and there’s no expectation that they should which puts the lie right off the bat to this sort of liberal. “There’s always two sides and they should be treated equitable.” When you treat the Nazis equitably, bring a Jewish survivor from a camp to talk about that experience, it’s expected that will be counterbalanced by the testimonial of one of the guards? Then you can say that, but no one ever says that. So why is it that we gotta have perpetrators’ points of view given equal weight or even superior weight in historical understandings of what happened to Native people or the political understandings or the economical understandings? “Well, there’s always another way of looking at it.” Yeah, there is. There’s the Nazi way of looking at it. Churchill: Nazis have no justifications. Churchill: …Well what I’m saying is that there’s no expectation that the other story has the integrity to be told. Churchill: …And sometimes they fabricate something. Churchill: They had to create a pretext and an illusion. The pretext is that they were up and concerned about my footnotes (in published writings). That was not the issue but that’s what they needed to say the issue was in order to do what it was they wanted to do for another reason. TNV: And you have denied all wrong doing. TNV: There is some concern over how your firing creates an imposed threat against being radical or controversial within the university context. There are other professors, who are may or may not agree with your politics and may or may not agree with the way that you would express yourself, who are concerned with what happened to you. They say your firing is a result of people disagreeing with your politics and your platform. Churchill: Then where are they? TNV: They’re quoted in the local newspapers, The Boulder Daily Camera and The Rocky Mountain News. TNV: There were only a few willing to speak out against your firing on the record. TNV: Why do you think that is? Because they don’t agree with your politics or don’t like your delivery style? TNV: What are they scared of? Churchill: Because they’re scared of what the implications of this are. The implications are that the academic institution, which is supposed to be a protected environment of true thought and expression, has now had the attention of the Governor to put pressure on the University to take can of removing someone who they thought was, whatever, making too much noise, getting too much press attention, making too many waves, saying things that made them look bad in some way. For accusing the United States of genocide, for example. TNV: You’re not the first one to do that. TNV: Look at Vine Deloria, for example. TNV: What is the “opposition trap of the United States” and who are these “evil doers”? Churchill: Okay, so now it’s Bush and Cheney and Rumsfeld and Rice. Now, which one of them ever picked up a rifle and killed an Iraqi or anybody else for that matter? I mean, Bush is a draft-dodger, Cheney’s a draft-dodger…Cheney said he had other things to do. It requires somebody besides those evil figure heads to actually do it. And who is that? 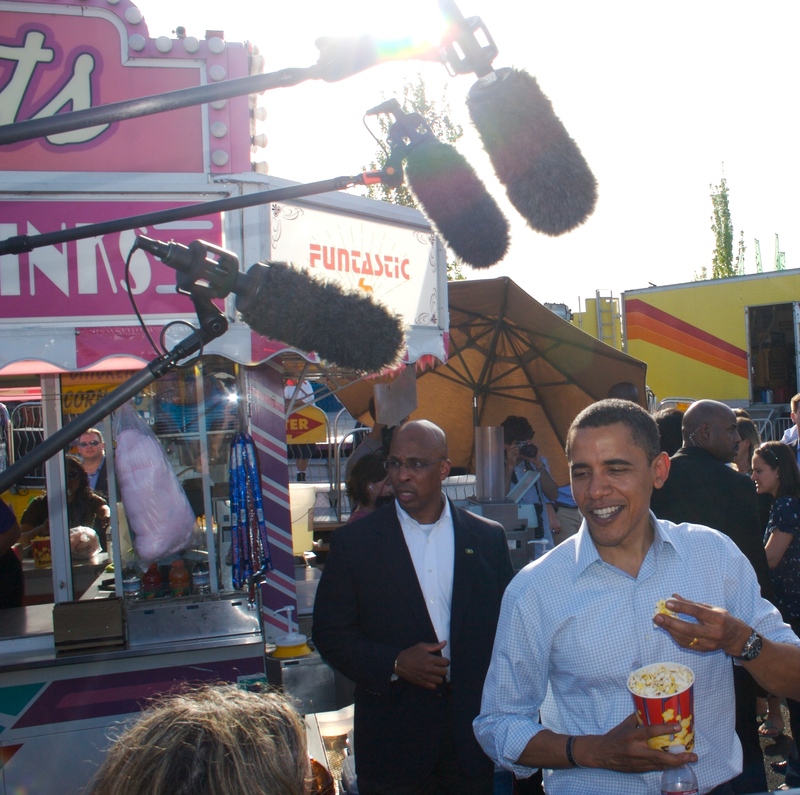 That s grass roots Americans, and a lot of Indian people. I’m fairly harsh on them, and I’m one of them (who served in the military). You are accountable for your actions. This is the Nazi defense, saying, “Well, ultimately nobody was responsible but Hitler because it was after all the fuhrer’s state, and the orders ultimately issued from Hitler so he was the ultimate responsible party and everybody else was obeying orders, even highly-placed government officials. And, of course Hitler’s dead so there’s no nobody to blame now. So, let’s revile Bush and Cheney and all of them. Let’s state our opposition. Let’s protest against them even while we benefit from it and do not come to grip with the fact that our next door neighbor and the things we even embrace go into making this process work. In that way we’re not an effective opposition, we’re chasing our tail around and around the same rock. Like alchemist thinking, if we do the same thing often enough it’s going to come out with a different result, rather than doing what actually would be required, which is to change the nature of the system. When you get out of ritual forms that are approved by the State, it starts to scary ‘cuz there might be consensus for the state which becomes this immoral state that s slaughtering people all over the world. By virtue of being a pacifist they might hurt you, that’s why cops carry guns. You know that’s why they employed Delta Force at Seattle when things got unruly (at the World Trade Organization meeting in 1999). What is Delta Force? It’s a surgical elimination unit. It kills people selectively. That’s all it is for. They were prepared to do that to maintain the economic state. Okay, we’re non-violent. We take a pledge of non-violence, so we guarantee that were gonna be goddamn ineffectual…we’re only purer to you because were risking nothing. TNV: Who specifically are you talking about? Churchill: Mass movements. Go over here to the Peace and Justice Center in Boulder. TNV: So you’re encouraging…you’re saying that peaceful movements, nonviolent movements are ineffectual? What about Ghandi? Nelson Mandela? My whole point is to de-stabilize your point because your process is criminal. I don’t endorse it. I, in fact, oppose it in meaningful terms am I killing people beyond that set of principles. TNV: So what are you calling on people to do? Churchill: Am I making some argument where the only purity is an armed struggle? No. There’s no purity in forms of struggle. There’s no purity in pacifism, there’s no purity in armed struggle, there’s no purity in any point in between. Purity is to figure out how to effectively take that which you find to be morally intolerable – morally lethal, in fact, to primarily but not exclusively brown-skinned people the world over. And, we’ve got plenty of experience of that here that’s called day-to-day life – and change it into something that does not have that effect. The current system sanctions only those things which will not disrupt its current function. TNV: Well, of course its primary purpose is to thrive in it’s own system…Having this conversation with you it is clear that the sentiment and argument against you goes way deeper than any footnotes in any book. You are challenging “the system” at large. Churchill: And so is the line of historical interpretation which sets things completely on their heads. Everything that was celebrated, anything that was trumped up in American History, I challenge.